It may be easy to think that God isn’t there in those times when it is not going your way, and those are the times that He may be calling you to rest in Him. 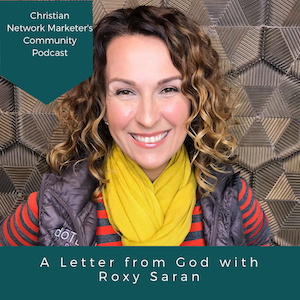 Today I have an interview with one of our community members, Roxy Saran (no relation 🙂 ) and how God is working in her business. Roxy was going for a really big goal in her network marketing business and found it challenging to get the 50 people on her team to do one thing all at the same time. As she was facing this challenge with frustration, she reached a point where she had to lay it down to God. Roxy talks about how she while attending a women’s retreat, she was reminded to rest in God, lean on God, and remember that, even though you are small, you will bear fruit. She also felt God telling her to rest in Him, and He will get the glory in achieving this goal. Soon after that things started to come together for her team, and one day she found herself praying for each person on her team and their businesses and their lives instead of asking God to bless her own. She also prayed for opportunities that wouldn’t come around otherwise, and her phone started ringing that night from people who were suddenly ready to buy. From those prayers for her team and for new opportunities, she launched 8 new leaders in the month. It was such a clear sign from God that He was at work and He was there. Even though entrepreneurship can feel like a lonely place at times, it doesn’t have to be. Set your sights on what your goals are and He calls you to it, He will equip you. Thank you for reading today’s post. Be sure to watch the entire interview below, and then head over to our free Facebook group to continue the conversation and share with us how God is working in your business.